I’ve said it before and I’ll say it again: I enjoy cooking, it’s a labor of love, but most days I am so crunched for time that I don’t get to enjoy it. That being said, I usually want to get in the kitchen, make something tasty, and then get out as quick as possible. I’m sure you can relate. That’s why my Crock-Pot and I have become best friends. 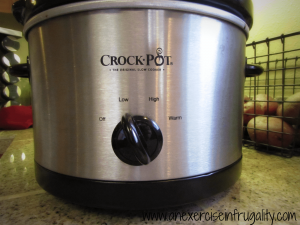 I’m always looking for new slow cooker recipes, and Pinterest is a great resource. 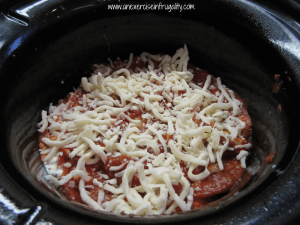 I stumbled upon a recipe for Crock-Pot Lasagna, and I was totally inspired. I researched many different versions, and tinkered around with the recipe until I found a perfect combination for the basic recipe. The best part about it is that it’s fantastic on its own (and, in the unlikely event you have leftovers, just as fantastic on the second day) BUT there’s countless ways you can tweak and customize it. More about that later! Did I mention you don’t have to precook the noodles? You could assemble this in ten minutes even if you are half-asleep first thing in the morning. It’s that easy. 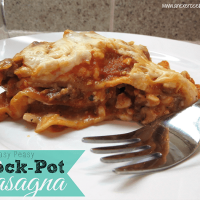 which is just perfect for 4 grown-up servings of lasagna! Brown ground beef and drain well, then mix with sauce. 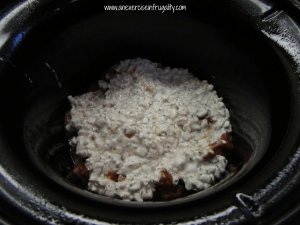 Spread 1-2 tbsp in the bottom of the slow cooker. Set the rest aside. 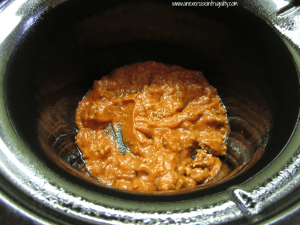 This step can be eliminated if you use a sauce with meat in it or a home made meatsauce. 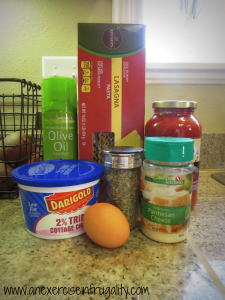 In a medium bowl, combine the cottage cheese, 1 tbsp of the Parmesan cheese, the egg and the Italian Seasoning. This is the part where I admit that I was too distracted with taking photos, that I actually forgot to put the egg in mine. Whoops. Still tasted good. I won’t lose sleep over it. Combine well. Set this bowl aside also. Take two uncooked lasagna noodles, and carefully break in half. If they bust into pieces, its ok, just toss them in but try to keep them in just two large pieces. Layer three across the crock. It’s ok if they overlap slightly. Then take your meat sauce and spread a third or so of it on top of the dry noodles. Don’t skimp-the more sauce, the easier time your noodles will have cooking properly. 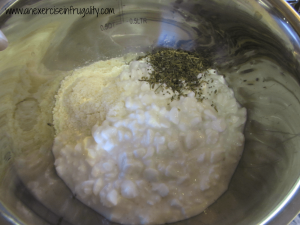 After the sauce layer, spread about 1/3 of the cottage cheese mixture on top. Then top this layer with 1/2 cup mozzarella cheese. Start again with another layer of uncooked noodles, then sauce, cottage cheese and mozzarella. You should have enough for three layers of each. Finish with the last of the mozzarella and Parmesan cheese. Then set it on low, and walk away. Dinner will be ready in 4 hours. Don’t add any extra water, and DO NOT open the lid during cooking. Make sure you bring your appetite when you come back, cause this stuff is delicious. You can add extra sauce if you want, but I thought it was fine without it. Use thin sliced zucchini or eggplant in place of noodles. 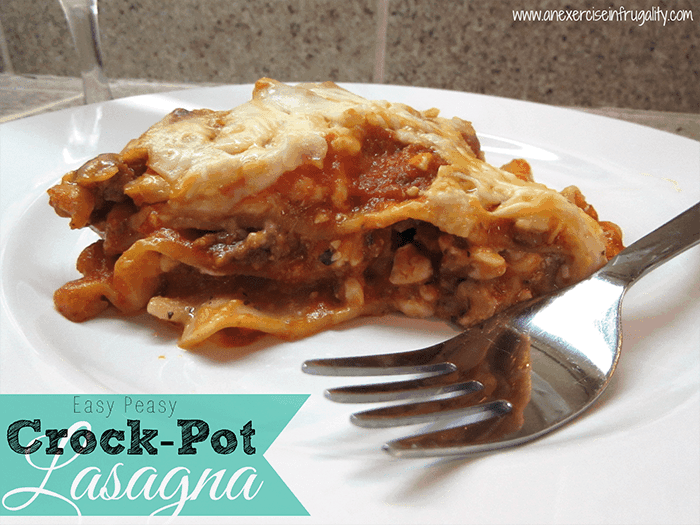 So there you have it: a super easy way to make lasagna that even the pickiest kids will love! If you try this recipe or one of my suggested variations, please make sure to tell me what you think of it in the comments! Also, if you think of another variation to add to the list, please share! You won’t use the whole box of noodles. Not even close! So save them for next time and you should get 2-3 lasagnas out of one box of noodles. 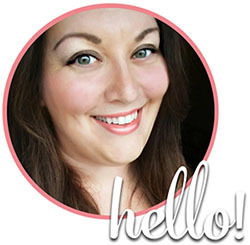 Budget-friendly, yay! 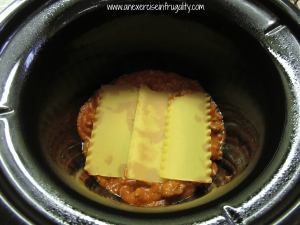 What do you think of my Crock-Pot Lasagna?